Have you ever heard that old song about how everybody loves a clown? As it turns out, that lyric might not be entirely accurate. It seems there are plenty of people out there who not only don’t love clowns, they’re deathly terrified of them. We’re not sure what’s up with that. After all, clowns’ only goal in life is to make us laugh, to provide us with entertainment, to give us something to take our minds off of…. Oh, wait. We just got a good look at this guy’s face. We get it now. Yep, clowns are terrifying monsters who will forever haunt our dreams from here on out. Glad we could get that sorted out. But hey, not every clown wants to be loved. We can’t say for sure what Mime Zack here wants out of life (or if he’s even technically alive), because we’re not about to get close enough to ask him anything. It seems like a pretty safe bet that he’s not the goofy, seltzer-spraying kind of clown, though. 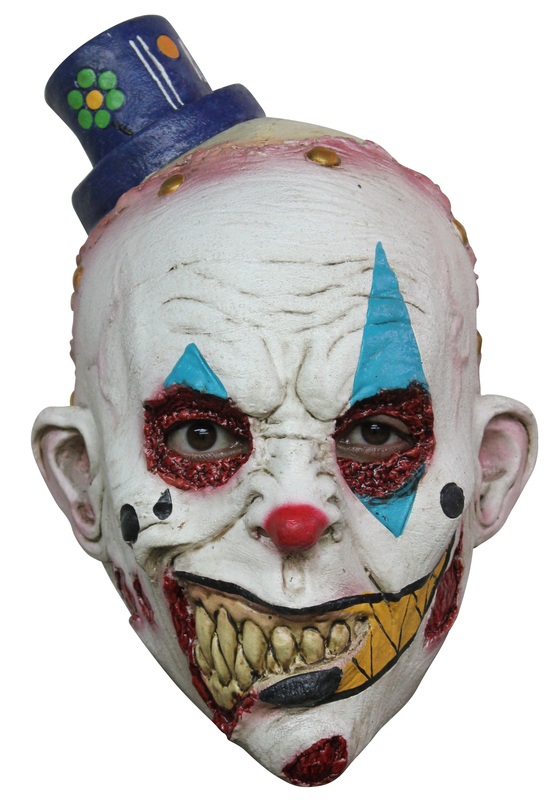 If you’re the type who’d rather generate shrieks than chuckles, then this latex, full-face mask is for you. The disturbingly detailed face includes multiple scars and holes, plus a set of jagged teeth and a jaunty blue hat that might even look playful if not for, well, everything else about the guy. You’re probably not going to get a lot of love while wearing this one, but we’re betting if you’ve read this far, creating warm fuzzies isn’t your top priority.